It is important to learn how properly clean, wash and maintain your Rainbow Rainmate Illuminated so it can last for decades. 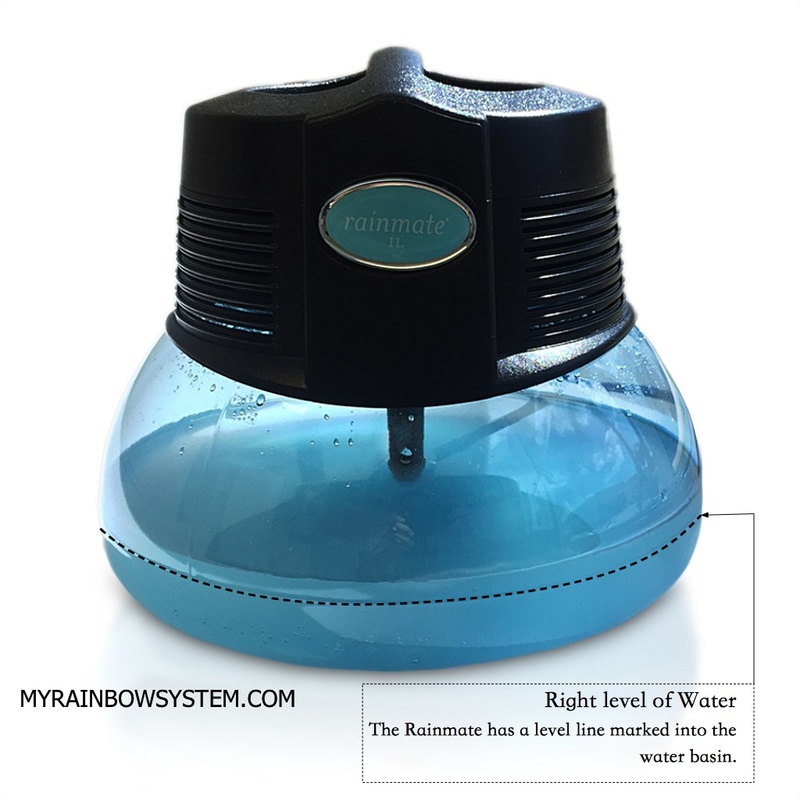 Your new Rainmate IL is very versatile and it can be running 24/7, eventually, the constant use and the mix of the Rainbow Fragrances oils, make the water dirty and therefore clog the Rainmate fan. If you keep using the Rainmate without a regular and simple maintenance, the Rainmate will start to vibrate and make weird sounds. 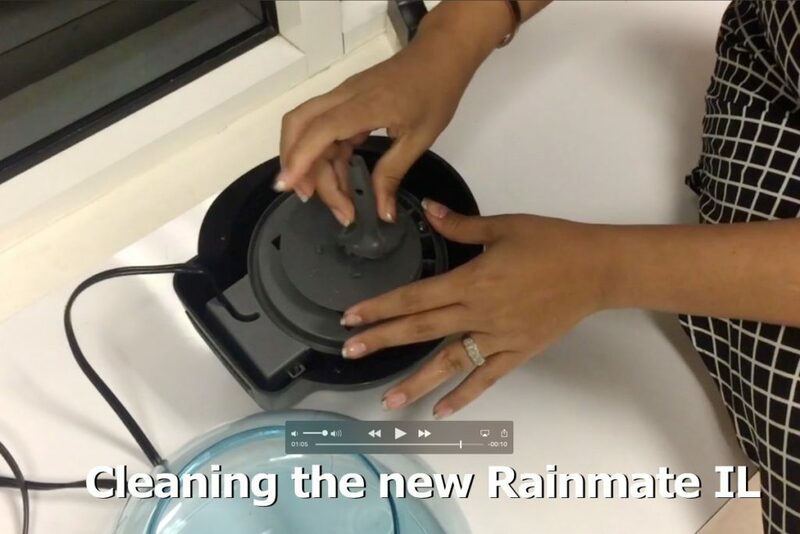 Refer to the following short video to learn how to clean your Rainmate IL. CAUTION: Cleaning Rainmate IL with hot water all the times, can eventually bend the Rainmate fan deflector and damage the Rainmate. Also, remember to clean your RainMate water basin with soap and water, every time you change a scent. The Rainbow Fragrances are specifically designed to use with your Rainmate or Rainbow, producing better smell on the water but at the same time, they are safe for the Rainmate. Most of the non-originals Rainbow Fragrances approved by Rexair can stain your Rainmate water basin and make it opaque, this is because these scents are designed for use with heat or electricity. Do you want to get Rexair approved Scents for your Rainmate at a special price? Do you also, want to know how to remove a strong odor from the Rainmate basin? REMEMBER: Do not wash your RainMate basin into a dishwasher. The Rainmate has a marked line into the water basin that shows the right water level needs to be used. NOTE: This post and video are related to clean the New Rainmate Illuminated, if you see small variations or differences between this one and your RainMate, probably you have an older model or Rainmate. How do I clean my older model Rainmate 2. The process to clean the old Rainmates and the new ones is the same, you can use this video for clean your Rainmate too. Rhonda, sometimes dirt and time can make the deflector stick, but if you try to pull it out a little bit harder, it will eventually go off. Rhonda, remember that the Rainmate fan is twist off while the fan come out pulling it out. Please take a second look of the video for more reference. Note: Some Rainmate model do not allow the fan to twist off (it is a whole assembly), but if you pull the deflector out you can still clean the whole part. Let me know if you could remove it. My dog ate the funnel part of the fan. How can I get a new one? Hi Glenda, unfortunately, We do not carry parts of any Rainmate for sale, I think Rexair stop selling the Rainmate repair kit. My suggestion is to try to contact Reaxir LLC for more precise information. Can you use young living essential oils in your rainmate??? Yes Wendy, as long as you clean very good your Rainmate after each use, there will be no problem! Note: Some oils do not produce any smell with the Rainmate, because Rainbow oils are made specifically designed to use in a water base container. Warning: Do not use any other oils other than Rainbow approved into the Rainbow basin! The Rexair approved scents build up should be easy to remove with just water, soap and a sponge. If you use a different fragrance non genuine it is probably that stained your water basin permanently, sometimes alcohol can help to remove the stain. Try and let us know. I also have super hard water and will soak my rain mate with a water/vinegar mixture. It definitely helps break down the minerals. Hi…how much water should I put in my rainmate ? Thanks ! You need to fill with water up to the line that is in the Rainmate water basin. The water basin have a level line marked. After using the Rain-mate for at least a decade, there is a build-up of dust on the inside of the motor and outside of the MOTOR. I do not see any videos or instructions about removing the MOTOR from the unit so that it can be cleaned. There seem to be dozens of posts about removing the post, the water fan and the cleaning the reservoir, but none of them address the dust build-up on the MOTOR itself. Taking it to the local sales office hasn’t helped either. The front desk person simply offers me a new water fan and post with a smile. That’s not the problem! I understand your concern. The Rainmate motor is sealed and can not be removed from the unit, the right way to clean it is from the outside using a brush. Rexair do not sell the Rainmate motor so that is why distributors can’t offer Rainmate motors for sale. Hope you this can help you. How do I clean the motor part? Dirt and dust are up in it and I cannot get to it to clean. The right way to clean it is from the outside using a brush. how often should you change the water? daily I assume? As a normal procedure, the Rainmate water needs to change daily.